The Alabama Centennial Half Dollar Coin commemorated the anniversary of Alabama's entrance into the Union of the states. Interestingly, Alabama's 100th anniversary occurred on December 14, 1919. The 66th Congress did not approve minting the commemorative coin until 1920 with the act becoming law on May 10, 1920. When approved, this Act became noted as Public Law 66-200. Furthermore, the US Mint did not produce the coins until 1921. The law noted there would be 100,000 silver 50-cent pieces "to be of the standard troy weight, composition, diameter, device and design, as shall be fixed by the Director of the Mint, with the approval of the Secretary of the Treasury, and said 50-cent pieces shall be legal tender in any payment to the amount of their face value." The law concluded the authorization with the Proviso: "That the Government shall not be subject to the expense of making the necessary dies and other preparations for this coinage." The coin's estimated value ranges from $144 (low grade - XF) to $2800 (high grade - MS-66). Extraordinary characteristics on the Alabama Centennial Half Dollar can command a price outside the estimated value range. The design on the front or obverse of the coin contains the first ever portrait of a living person. The left portrait shows William Wyatt Bibb, the first governor of Alabama. The right portrait presents T.E. Kilby, the governor of Alabama during their centennial celebration. The 22 stars symbolize Alabama becoming the 22nd state to join the Union. 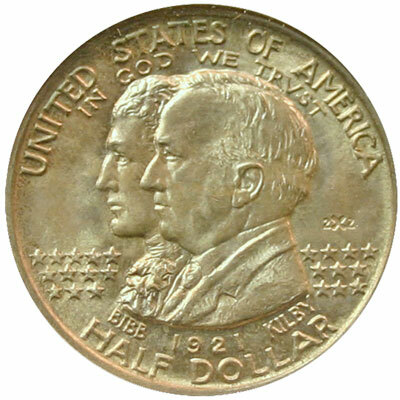 The coinage inscriptions include United States of America, Half Dollar, In God We Trust, and Bibb 1921 Kilby. And, take a look, the "U" in United is rounded, but the "U" in Trust uses the pointed "V" shape. Per wikipedia, in the Late Middle ages, the pointed "V" shape was used at the beginning of words and the rounded "U" shape in the middle - just the opposite of the usage here. The image on the reverse of the coin is an adaptation of the State Seal of Alabama at the time of the centennial celebration. The eagle stands on a shield of the United States with arrows under his feet. He holds a ribbon in his beak containing the words "Here We Rest." 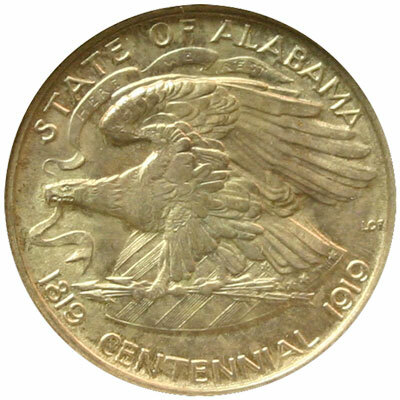 The coinage inscriptions say, State of Alabama and 1819 Centennial 1919. On the right, the small initials LGF for the artist can be seen. Though the stated mintage was 100,000, records show roughly 65,000 were distributed. The lower number could be due to the coins not being available during the centennial celebration year. Not quite half of the 65,000 coins included the 2X2 in the obverse design. The 2X2 versions are valued slightly higher than the Alabama Centennial coins without the design element. Governor Bibb first became the governor of the Alabama Territory in 1817. When Alabama became a state in 1819, Governor Bibb served as the state's first governor from 1819 to the summer of 1820 when he died of illness. The reverse of the Alabama Centennial half dollar coin is based on the Great Seal of Alabama at the time of the centennial celebration (opens in new window). This seal was used for 71 years, but it was not the initial seal, nor is it the seal of Alabama today. As territory governor, Bibb was granted approval to select a great seal. He chose one showing a map of the territory with its rivers. The state adopted that seal and used it for 50 years until the state legislators chose the seal with the eagle. In 1939, the legislators unanimously approved going back to the original Great Seal of Alabama (opens in new window), which is still in use today. Visit our GACS Numismatic Shoppe Alabama Centennial for a variety of useful items decorated with images of the classic commemorative silver half dollar coin.